Our speakers were geology professor Ed Keller of UCSB and Engineering Geologist Larry Gurrola, who also works and studies with Ed. That’s Ed in the shot below. As a geology freak, I know how easily terms like “debris flow,” “fanglomerate” and “alluvial fan” can clear a room. But this gig was SRO. 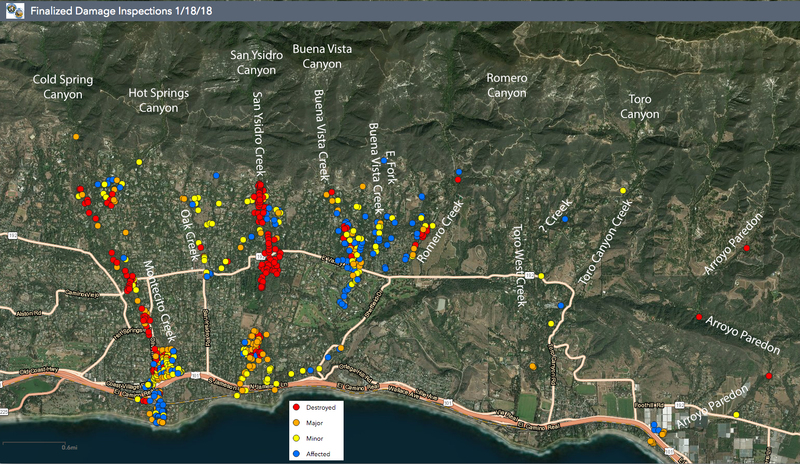 That’s because around 3:15 in the morning of January 9th, debris flowed out of canyons and deposited fresh fanglomerate across the alluvial fan that comprises most of Montecito, destroying (by my count on the map below) 178 buildings, damaging more than twice that many, and killing 23 people. Two of those—a 2 year old girl and a 17 year old boy—are still interred in the fresh fanglomerate and sought by cadaver dogs. The whole thing is beyond sad and awful. The town was evacuated after the disaster so rescue and recovery work could proceed without interference, and infrastructure could be found and repaired: a job that required removing twenty thousand truckloads of mud and rocks. That work continues while evacuation orders are gradually lifted, allowing the town to repopulate itself to the very limited degree it can. I talked today with a friend whose business is cleaning houses. Besides grieving the dead, some of whom were friends or customers, she reports that the cleaning work is some of the worst she has ever seen, even in homes that were spared the mud and rocks. Refrigerators and freezers, sitting closed and without electricity for weeks, reek of death and rot. Other customers won’t be back because their houses are gone. Click on the map for a closer view, or click here to view the original. On that one you can click on every dot and read details about it. I moved here twenty-five years ago, attracted by the natural beauty and semirural ambience, the short walk to the beach and the Lower Village, and the enveloping views of the Santa Ynez Mountains, which rise abruptly from the coastal plain to hold the community in a stony embrace. We have no sidewalks here, if you except the business districts of the Upper and Lower Villages—if we want sidewalks, we can take the five-minute drive into Santa Barbara or, more ambitiously, fight traffic all the way down the coast to Los Angeles. But we don’t want sidewalks. We want nature, we want dirt, trees, flowers, the chaparral that did its best to green the slopes and declivities of the mountains until last month, when the biggest wildfire in California history reduced it all to ash. Fire is a prerequisite for debris flows, our geologists explained. So is unusually heavy rain in a steep mountain watershed. There are five named canyons, each its own watershed, above Montecito, as we see on the map above. There are more to the east, above Summerland and Carpinteria, the next two towns down the coast. Those towns also took some damage, though less than Montecito. Debris flows require sloped soils left bare and hydrophobic—resistant to water—after a recent wildfire has burned off the chaparral that normally (as geologists say) “hairs over” the landscape. For a good look at what soil surfaces look like, and are likely to respond to rain, look at the smooth slopes on the uphill side of 101 east of La Conchita. Notice how the surface is not only a smooth brown or gray, but has a crust on it. In a way, the soil surface has turned to glass. That’s why water runs off of it so rapidly. Wildfires are common, and chaparral is adapted to them, becoming fuel for the next fire as it regenerates and matures. But rainfalls as intense as this one are not common. In just five minutes alone, more than half an inch of rain fell in the steep and funnel-like watersheds above Montecito. This happens about once every few hundred years, or about as often as a tsunami. Fires happen almost regularly, spreading most widely where chaparral has matured to become abundant fuel, as the firefighters like to call it. Flood events are more random, given the relative rarity of rain and even more rare rains of “biblical” volume. But they do happen. Stream beds in the floors of canyons accumulate rocks and boulders that roll down the gradually eroding slopes over time. The depth of these is expressed as basin instablity. Debris flows clear out the rocks and boulders when a big flood event comes right after a fire and basin becomes stable (relatively rock-free) again. 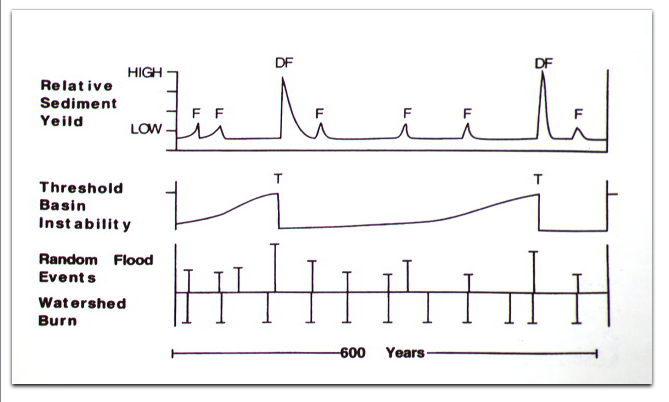 The sediment yield in a flood (F) is maximum when a debris flow (DF) occurs. 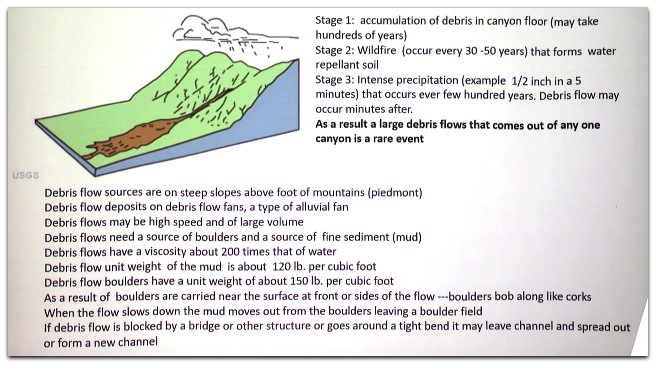 Debris flows tend to happen once every few hundred years. And you’re not going to get the big ones if you don’t have the canyon stream bed full of rocks and boulders. Destruction down Oak Creek wasn’t as bad as on Montecito, San Ysidro, Buena Vista and Romero Creeks because the canyon feeding it is smaller. Where a debris flow forked south of Mountain Drive after destroying San Ysidro Ranch, continuing down both Randall and El Bosque Roads. Looking back at Ed’s basin threshold graphic above, one might say that there isn’t much sediment left for stream beds to yield, and that those in the floors of the canyons have returned to stability, meaning there’s little debris left to flow. But that photo was of just one spot. There are many miles of creek beds to examine back in those canyons. Still, one might hope that Montecito has now had its required 200-year event, and a couple more centuries will pass before we have another one. Ed and Larry caution against such conclusions, emphasizing that most of Montecito’s and Santa Barbara’s inhabited parts gain their existence, beauty or both by grace of debris flows. 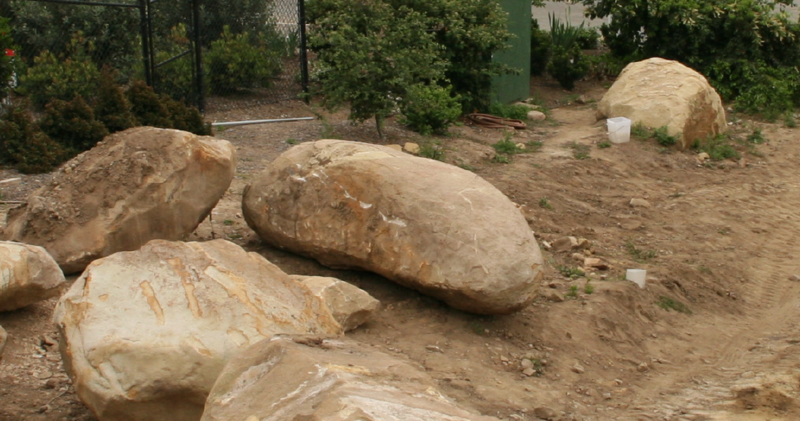 If your property features boulders, Ed said, a debris flow put them there, and did that not long ago in geologic time. This is deep in the heart of Santa Barbara. The matrix mud we now call soil here is likely a mix of Juncal and Cozy Dell shale, Ed explained. Both are poorly lithified silt and erode easily. The boulders are a mix of Matilija and Coldwater sandstone, which comprise the hardest and most vertical parts of the Santa Ynez mountains. The two are so similar that only a trained eye can tell them apart. All four of those geological formations were established long after dinosaurs vanished. All also accumulated originally as sediments, mostly on ocean floors, probably not far from the equator. What it shows is how, when the Pacific Plate was grinding its way northwest about eighteen million years ago, a hunk of that plate about a hundred miles long and the shape of a bread loaf broke off. At the top end was the future Malibu hills and at the bottom end was the future Point Conception, then situated south of what’s now Tijuana. The future Santa Barbara was west of the future Newport Beach. Then, when the Malibu end of this loaf got jammed at the future Los Angeles, the bottom end of the loaf swept out, clockwise and intact. At the start it was pointing at 5 o’clock and at the end (which isn’t), it pointed at 9:00. This was, and remains, a sideshow off the main event: the continuing crash of the Pacific Plate and the North American one. 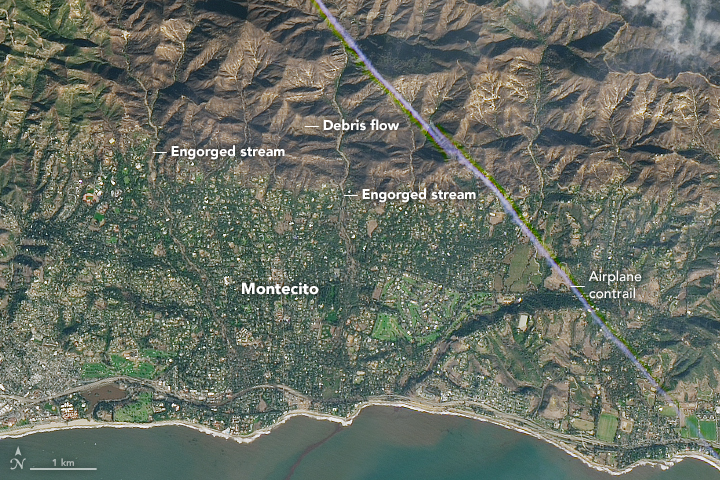 Find more geology, with lots of links, in Making sense of what happened to Montecito. I put that post up on the 15th and have been updating it since then. It’s the most popular post in the history of this blog, which I started in 2007. There are also 58 comments, so far. I’ll be adding more to this post after I visit as much as I can of Montecito (exclusion zones permitting). Meanwhile, I hope this proves useful. Again, corrections and improvements are invited. USGS Geologists Join Efforts in Montecito to Assess Debris-Flow Aftermath. The Independent has a comprehensive and frequently updated Montecito Mudslides Disaster Assessment Map. Felicia S. blogs The Silence of Epiphany: An Unexpected Lesson in Geology. CNN Report: Her parents died in the mudslide. A stranger brought her mom’s earrings back to her. The Facebook page in the report is Montecito Lost and Found. 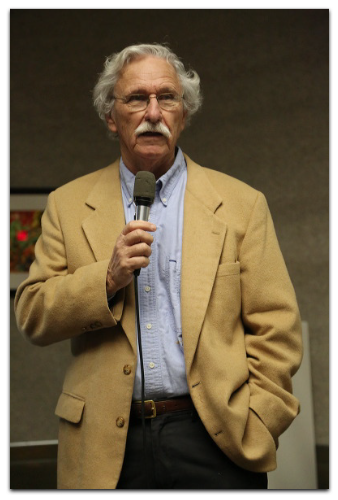 It is really painful to see what a knowledgeable person such as Dr Keller has to say about the dynamics of the Montecito watershed. Clearly if he had been in the room with our ‘safety officials’ when the decision was made to use Hwy 192 as the demarcation line between mandatory evacuation and voluntary evacuation that line would have not stopped at 192. One would hope that experts like Dr. Keller would be called on to help draw a new flood risk map depicting mandatory evacuation zones but to do that the County would be admitting that the map they relied on before the tragedy was seriously flawed. And of course that would put the County in legal jeopardy. Wonderful stuff, Doc. Thank you for doing this. There is no point at which Montecito Creek runs under Olive Mill Road, so that “culvert” would actually be the bridge under Hot Springs Road just north of the Olive Mill intersection. Thanks, Mac. Just corrected the text. Clicked on the “terrific animation” and downloaded only to find I can’t open anything. Is it possible to post this in another form? Unfortunately, cj, that UCSB site does not make it easy. 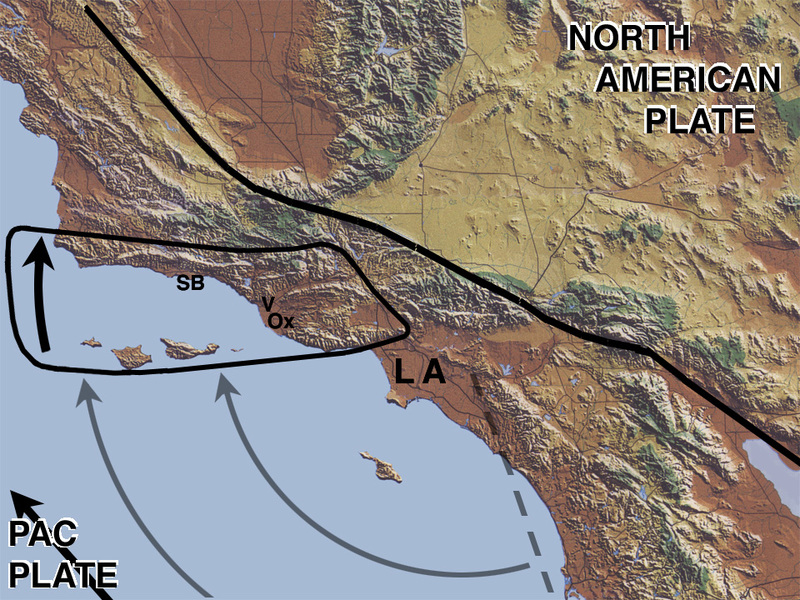 You have to click on Download: Southern California Tectonics movie and related images (52 MB). This pulls down a file called SoCalifTect.zip. Open that and you get a folder called dSoCalifTect. Inside that folder is are a bunch of files, all produced by Tanya Atwater, now of Scripps in San Diego, when she was still at UCSB, back in the early ’00s. The animation is the file called “SoCalif_Tectonics.mov.” I tried to put it on my blog’s server, but it balked because the file is too big. Then I put it on my own server (at searls.com), and for some reason it wouldn’t play from there. No idea why. That’s why I wrote a narrative description of what it shows. I think I might now add another visual from that folder, which should also help. Alas, we learn many things the hard way. Somewhere there is a report on how the Painted Cave Fire was a catalyst that got multiple administrative entities to cooperate under one “incident command.” Maybe it was another fire. The point is the same: multiple specialties need to converge in order to prepare for and deal with disasters like this. I am sure there is a similar history, way back, that gave us the Los Angeles Flood Control District. Santa Barbara County has one of those too. 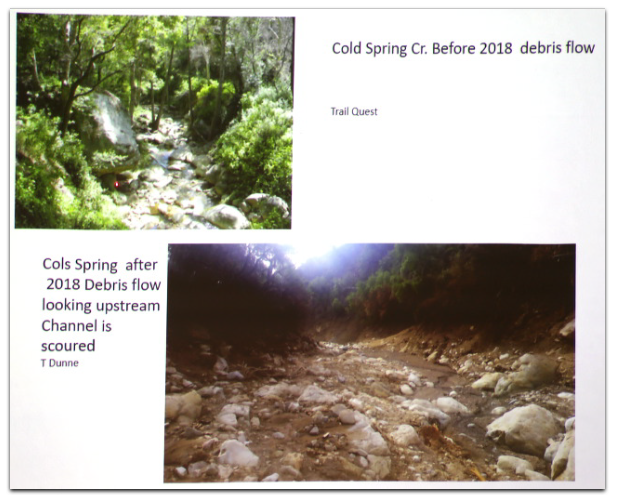 But I am sure it is less preoccupied with debris flows than “Flood,” as the LA entity is called, because debris flows here are rare, while on the face of the San Gabriel Mountains they are frequent enough to be treated as a constant threat. That’s why the debris basins at the mouths of canyons there tend to be many acres in size. Or many square miles in some cases. In looking at the mountains above Montecito today, I couldn’t help but assume that it’s time for bigger basins. But bear this in mind: they won’t be pretty. * Or cheap. On Twitter, @TCBoyle asked, “any conclusions drawn? Other than that all this is destined to repeat and repeat?” I replied, “I think it depends on what our scientists find in their hikes up the canyons. If the stream beds are now bare of rubble re-landscaped over Montecito or carried off to landfills and beaches, we’ve got another couple hundred years. If not, we build LA-scale catch basins.” But that’s just a best guess. I look forward to what Ed and his colleagues find out. And hope in the meantime we get enough rain to fight the next drought while not washing more mountain down over Montecito. There is quite a difference between the topography of the La Basin and Montecito. In Montecito the mountains and the ocean are far closer leaving very little room for catch basins of a size that could contain the massive amounts of debris that came cascading down on that Tuesday morning. Also from the LA catch basins to the ocean most if not all the creeks are concrete lined now. As are in fact quite a few of the creeks in Goleta. Turning the bucolic creeks of Montecito into concrete lined channels would certainly reduce flooding but not likely to be accepted by the community. In truth there are probably no good options for Montecito. The die was cast by decades of developments on a flood plain and on the banks of creeks. In my opinion the best that can be hoped for is a restructuring of the agencies that developed and implemented the terribly flawed evacuation plan. On the matter of catch basins, some are already there. And I suspect there might be room for larger ones back up in the canyons. I suspect they might make make for ugly hiking, but not spoil the views up from below. Or not much, anyway. L.A.’s whole situation is different—with the exception of the need to deal with debris flows coming out of the mountain front. The San Gabriels are less foliated, higher, steeper and produce many more debris flows than we tend to see here. That said, we do have them. And the situation isn’t much different for Santa Barbara, Summerland, Carpinteria, Ojai and Goleta. Had a giant rain fallen on the mountain front above Santa Barbara right after the Jesusita fire, what followed would likely have been very similar. And you’re right about agency reform. Thanks to that link, Robert, I just added an corrective addendum to my comment above. I’ve puzzled over that one. Pored over lottsa maps, none of which named either the creek or the canyon. I even asked Ray Ford, and then finally stumbled on it myself. I still lack corroboration, but I think it’s simply called Toro Canyon West. Also not sure if it was Toro Canyon East or West that caused the damage (as shown on your source map) at 321 Toro Canyon Road. The two creeks run pretty close together at that point, then diverge with West draining into the ocean at Loon Point, and East , uh, farther east along Padaro Lane. Strange that after so many years here that it would take a disaster to motivate me to learn a few place names. Thanks, Mac, for your work on the case. I just updated the map in the post. Note that “West Toro” goes straight down to the ocean from the mountains, and that a branch creek (which I’ve left with a ?) is where some damage occurred as well. Where did you find that map, by the way? June 2017, which describes plans to remove debris basins, to restore natural settings and allow fish to pass upstream (presumably when the stream is actually wet). This includes the Cold Spring, San Ysidro and Romero Canyon basins. In fact all were scheduled for removal last fall, and were barely noticed by the debris flows of January 9. Please read it, folks. I’m only beginning to get my head around it. Thanks, Ajf. I sometimes think my inner rockhead is outer too much of the time, since I look at the world largely through a geological lens. Glad that came in handy here. It’s interesting to me that our state tree, the redwood, is adapted to fire. And the state flower, the California Poppy, is adapted to earthquakes (because—as I understand—it likes lots of fresh minerals around exfoliating rocks in dry soil). I believe one reason there is less controlled burning in coastal California is that so much of it burns over anyway. Actually back in the 1970’s as I recall the Los Padres Forest embarked on an ambitious plan to do controlled burns along the South Face of the Santa Ynez Mountains from Gaviota to Matilija. The plan was to create a dozen or so fuel breaks from Camino Ciello down ridges to the foothills creating blocks of fuel that would be individually burned in early winter months at a 10 year or so frequency. They went as far as doing an Environmental Assessment. Unfortunately it never materialized and I heard it was because of funding. I think the powers that be in Washington felt it was not the responsibility of the Feds to fund fire protection strategies designed to protect communities that allowed people to build homes in fire prone areas. Controlled burns are practiced in the major forests since around the late 1970s or early 1980s. We hiked through a few on the toulleme trail. It was also why we slowly saw less of Smokey the bear around that time. But yes I know the sequoias have not been able to reach the upper Sierra , relegated to middle and lower sierra, possibly due to insufficient fire. Did not know that abt the poppy. Love this state. I’ll try to follow up to ask abt jurisdiction of Los Padres. We’re trying to release next year’s funding now in some areas up here for efforts just like you describe.